Fast, accurate tire pressure readings you can count on! The Accutire Programmable Digital Tire Gauge takes the guesswork out of maintaining safe tire pressure. Program your tires' recommended tire pressure into the tire gauge so you'll always know the target tire pressure for your vehicle. Never underinflate. Never overinflate. The Accutire Programmable Digital Tire Gauge makes it easy for you to maintain perfect tire pressure for safer driving and optimum fuel efficiency. When you use the Accutire Programmable Digital Tire Gauge to regularly check your tire pressure, you are doing yourself and your vehicle a huge favor! Proper tire pressure improves fuel efficiency, improves your vehicle's balance and handling, and prolongs the life of your tires. All those benefits from one easy-to-use, inexpensive tool! The Accutire Programmable Digital Tire Gauge stores your tires' factory recommended tire pressure so there's no guessing. After all, what good is knowing your current tire pressure if you don't know what it should be? The Accutire Programmable Digital Tire Gauge gives you all the facts so you can be sure your tires are properly inflated. 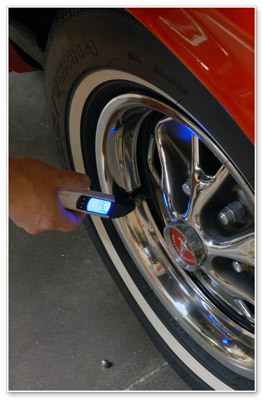 The Accutire Programmable Digital Tire Gauge measures tire pressure from 5-99 PSI. A blue backlit, digital display is easy to read during the day or night. A white LED light on the tire gauge's tip allows you to see the tire valve. A hard storage case is included to protect the tire gauge in your glove compartment or trunk. The Accutire Programmable Digital Tire Gauge has a 5 year manufacturer warranty. Tire pressure is so important to the safety of your vehicle. Why trust it to any tire gauge? Get the Accutire Programmable Digital Tire Gauge and get accurate tire pressure readings every time. it last less than 2 years. I purchased this tire pressure gauge several years ago. It has never made a good seal on the tire stem, so getting a good measurement is impossible. I will never buy an Accutire digital tire gauge again. Battery is not replaceable!! Don't waste your money! !